Customer loyalty and rewards with the flexibility you want, and the results you need. Special Beta Offer - Annual subscriptions get 5 months free! Why don't you have the tools you need to connect with your customers (and sell to them) on-demand? Pebble connects you with your customers on-demand and gives you customer loyalty tools that works exactly the way you want them to. Most loyalty programs use punch cards or coupons that force your customer come to you. Reward your best clients. Partner with other businesses. Surprise and delight your customers. 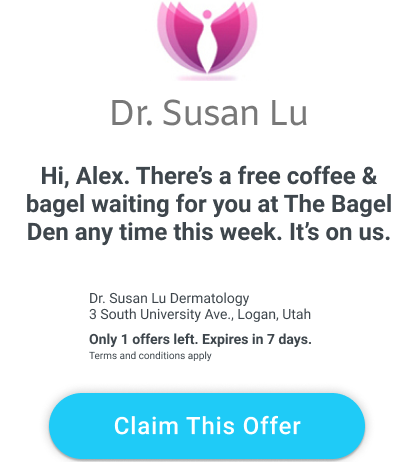 Pebble let’s you deliver ANY offer, coupon or loyalty incentive directly to their phone in real time. Now you can deliver your customer loyalty rewards individually or at scale with total control. The result is a flexible new tool to build amazing customer loyalty and remarkable word-of-mouth at the push of a button. It’s easy for business owners to love us, which is why so many do. Built for every local business; doctors, dentists, and dog-walkers, butchers, bakers and candlestick makers. 82% of local small businesses that fail are killed by a cash flow problem. 67% of local business owners worry about cash flow every month. As a business owner, control of your cash flow is critical. Pebble gives you the tools to respond to cash flow problems on-demand, allowing you to create new cash flow as you need it. Any marketing company can say they deliver ROI like Pebble on a website. On a spreadsheet it's a bit more difficult. Send to specific individuals or targeted segments like your "next available" list without spamming your entire contact list. Add limits by number, recipients, send time, and everything else you need to keep complete control. Pebble handles notifications, tracking, and reporting automatically, so there's no more back-and-forth with patients needing information. Add or select individuals or a patient segment, send, and Pebble handles the rest automatically. Their marketing campaign will help you grow your sales in 3 months. Pebble will do it in 3 minutes. Pebble is built for real-time sales, not general marketing. It's fast, efficient, and has immediate ROI. The sales rep wants you to spend $8,000 to bump up sales in the next 3 months. You need to make an extra $1,200 this week. Sales reps walk in to your business every day and tell you to think big. That it takes money to make money. That they just signed up your competitor and that you can’t afford to be left behind. That they’re here to “help you grow your business”. We can't really blame them. Their commission check depends on how much they can get you to spend. They make money by getting you to pay to get in front of their audience, most of which will never be your customers. But they charge you for them anyway, squeezing you for every penny. While salespeople will tell you that you need to spend big and get in front of as many people as possible. They’ll tell you that their audience fits your “target demographic” and throw in a few useless upgrades to get you to sign their contract. Think big they will tell you. We’re not pie-in-the-sky advertising salespeople. We don’t work on commission or skim your profits. We’ve walked in your shoes ourselves and we know the problems you stare down the barrel of every day. Because you need to have the tools to control of your business and cash flow today, and be able to respond to what’s happening right now. It’s why we built Pebble - to give you those tools. So while advertising sales reps may feed you a big story, we know we have a better story to tell. Pebble is built for immediate sales. Customer loyalty drives sales and profitability. Pebble gives you the tools to connect with buyers and drive sales in real time by matching value with demand. How does Pebble give me control of my cash flow? How I can use Pebble? You can use Pebble any way you want. Will Pebble change the way we already work? Nope. Pebble is simple and straightforward. You don’t have to hook it up to anything or give it access to any other system. It works when you need it, and gets out of your way when you don’t. Pebble solves the problem of “I need to push a button and get an appointment filled in the next 5 minutes”. Use Pebble as often as you want. Many businesses use it multiple times a day to fill appointments, send reminders, and fill unfilled appointments by sending ‘micro-offers’ to just a few people at a time. .
What training do I need? What about support? Fortunately, Pebble is awesomely simple to use so you’ll probably never need our dedicated playbooks, knowledge base, email or phone support. But if you do, we’ve got your back. In fact, we LOVE hearing from you when you have a problem we can fix or something doesn’t quite make sense or is confusing. We’ll sort it out tout suite. of businesses that fail are killed by a cash flow problem. of small business owners worry about cash flow every month. of your patients prefer to be texted. For even more reasons to try Pebble, just continue working without it. Try Pebble risk free and see just how easy it really is.